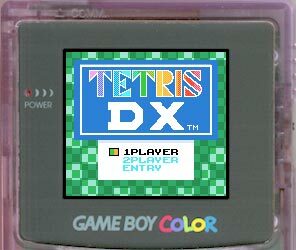 L'un des meilleurs emulateurs Gameboy. Il emule egalement le gameboy color. Improvements to debugger, including undo rom edits, ctrl+tab changes active control. New in BGB 1.5.2 (2015-08-17) - Fixed a large number of bugs and problems, including: glitches in pokemon linking. Screensaver now doesn't start if you play with gamepad. Crash/stability fixes. Many small improvements, including efficiency improvements. Added support for more joypad axes (xbox 360 controller). Various debugger GUI improvements including local symbols. 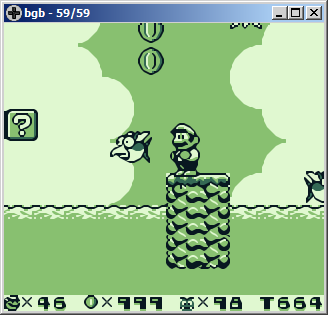 New in BGB 1.5.1 (2014-11-14) - Fixed a number of bugs, including Donkey Kong Land and possibly other roms being broken, and a bug that caused it to sometimes not work on a secondary monitor. New in BGB 1.4.3 (2013-07-01) - fixed: loading/saving save files for roms with unicode filenames was broken if a save dir is not set. this was broken in 1.4.2. New in BGB 1.4.2 (2013-06-30) - fixed a large number of small problems and bugs including: direct3d now works on secondary monitors, some accuracy fixes (including sagaia problem), added some features including: mono sound output and an exception break if making bad accesses during an OAM DMA transfer. tested to work on windows 8. New in BGB 1.4.1 (2012-08-27) - fixed time keeping problems (hiccups) on windows 7. fixed inaccuracy in mid-scanline change of LCDC bits (gejmboj). fixed a condition that would cause inaccurate timing of interrupt (final fantasy adventure). added "gameboy or GBC" system mode setting. added "blurry" doubler. fixed searching any opcode with a space giving "IO error 105". added field in IO map to view/edit the "low" bank of multicart emulation. fixed "remotejoy" being broken. screen window can now init on secondary monitor. fixed failure of GUI elements initing on secondary monitor. fixed wrong field in wav file written. greatly improved game link accuracy, most games should now work perfectly. Major debugger improvements: Supports SYM files containing debug symbols. "on jump" access breakpoints. immediate entry of data into assembler, data, and stack viewer. improved assembler flexibility. Multiline code/data entry window. Keyboard shortcut for navigation to previous/next breakpoint, label etc. Live update memory mode. edit IO map registers. Fixed causes of accidental running while debugging. Sound quality improvements: CH3 and CH4 are now bandlimited in high quality mode. Improved DC offset accuracy. fixed sound timing inaccuracies. Improved WAV writer + screenshot recording. Fixed audio/video desync problems. Exported files are now better named. fixed windows 98 compatibility problem. eliminated requirement for DX9. improved wine support. Many small bug fixes and improvements. New in BGB 1.3.2 (2011-04-10) - more accurate SGB color scheme. improved detection of non-working vsync. fixed: bootroms don't load if read only. fixed: "load rom dialog on startup" not working. fixed: "game controller works only if focus" not working. fixed: setting borderless window, and switching to fullscreen, if using directdraw, the "window" can still move, and cause graphical glitches and crash. 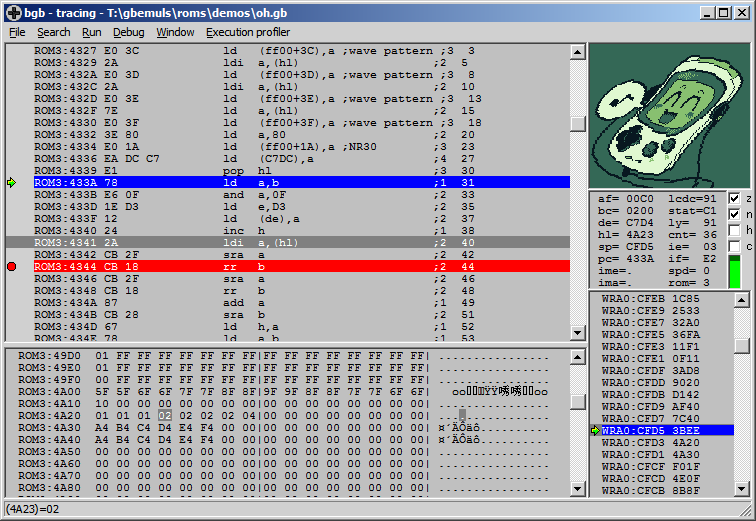 fixed: GBC accurate initial WRAM values as left by bootrom (fixes the menu in baby felix - halloween). fixed: a sprite on X = 0 uses more time in mode 3, too. fixed: inconsistent timing if resetting in the debugger.